Walmart was named the top Greenwasher of 2014 by The Green Life environmental group. Environmental watchdog The Green Life has named Walmart the top Greenwasher of the Year for 2014 for marketing itself with misleading claims of environmental sustainability. In 2005, Walmart made headlines with big promises to become greener, but nine years later, the world’s largest retailer doesn’t have much to show for it. Walmart promised that it would transition to 100 percent reliance on renewable energy, but today only 4 percent of the electricity Walmart consumes comes from renewable sources. In fact, even the company’s self-reported carbon footprint actually increased by more than 13 percent since it made its commitments to renewables in 2005. Meanwhile, despite Walmart’s promises to sell more sustainable products, the company’s supply chain continues to stretch around the world. Transporting consumer goods around the world consumes a huge amount of fuel, meaning that the products on the shelves of a local Walmart come with a massive carbon footprint. On Earth Day, environmental activists all over the U.S. delivered letters to Walmart stores calling on the company to become serious about protecting the climate. 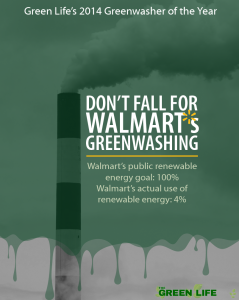 A petition protesting the greenwashing at Walmart is available at http://bit.ly/1lQofKl.